I decided to fulfill my own request for this month. I didn’t have much time to spend writing a new app, so I decided to grab Lifecycle Event Editor code from the EXE and tweak it to run inside Vault Explorer. The plug-in itself has the exact same feature set as the exe. But if you are not familiar with it, here is a quick run down. You can use the Lifecycle Event Editor to tell the server to fire jobs when objects move through specific lifecycle states. For example, you want a job of type “Dougpunch” to be created every time a file goes from For Review to Released, you might set something up like this. If you commit the changes then look at the Job Queue... you won’t see anything. The Lifecycle Event Editor does not actually put any jobs on the queue, it just lets you configure the server settings. The “Dougpunch” jobs show up when you move files from For Review to Released. Of course, if you try this out in your Vault nothing interesting will happen. It will just result in a bunch of Dougpunch jobs on the queue that sit there until deleted. There is nothing that is set up to handle Dougpunch jobs. At least I hope there is not. 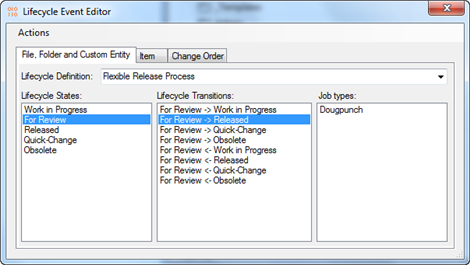 The lifecycle event feature is useful for when you define your own job types through the API. There are also some utilities, such as Project Sync, which hook into this framework. Job Processor is constantly logging in and out of Vault. So plugging-in to that app is different than with Vault Explorer, where you assume that the user is mostly staying logged in as a single user. Job Processor, on the other hand, may have zero, one or two simultaneous log-ins at any given time. Job Processor logs in to the server, but not to a specific Vault. This type of log in has limited functionality and does not consume a license. Job Processor checks the Job queue. Job Processor logs in to a Vault. This part consumes the license. Job Processor logs out of Vault, which frees the license. Job processor logs out of the server. Job processor goes to sleep. Go back to step 1 after X number of minutes. So yes, at times Job Processor is logged in twice. Although the same username and password are used, the contexts are different. For all intents and purposes, they are completely separate log-ins. Each job gets its own log-in, so your Execute handler should not be remembering anything about the context. If your plug-in wants to do any useful Vault operations during the Wake or Sleep events, it will have to have its own set of credentials (see Watch Folder 2013). You can query the job queue without being logged into a specific Vault. However, adding a job to the queue requires you to be logged in to a Vault. Speaking of Watch Folder, I hooked it up to our internal Vault at Autodesk. Every day I get a report of what’s going on in the Vault, and it’s been running solid for the past 8 months. IExplorerUtil had a bug that was caused by it remembering the login context. If you are using IExplorerUtil tool inside Job Processer 2013, make sure to grab the hotfix. Note: The hotfix has been rolled up into Service Pack 1. The Vault API is sometimes redundant, and it can also repeat itself. One place were this is painfully obvious is with file name generation. If you want to generate a file name, there are two completely separate mechanisms to choose from. Each has its own set of API functions with their own sets of pros and cons. You have to choose which is best for your needs. There is no one mechanism to rule them all. To make matters worse, they have similar names. Once engine is for file naming schemes and the other is for file numbering schemes. If you are not paying attention, you may mistake one word for the other. It’s annoying, I know. It’s like reading a three volume fantasy epic where one villain is called Sauron and the other is called Saruman. This is a pretty basic mechanism, so it's good if you want something quick and simple. It consists of an auto-increment number with a string prefix and suffix. I believe that Copy Design uses this feature. One nice feature is that you can “rollback” a name if you decide not to use it. For example, the user hits Cancel on your dialog. This is much more complex. 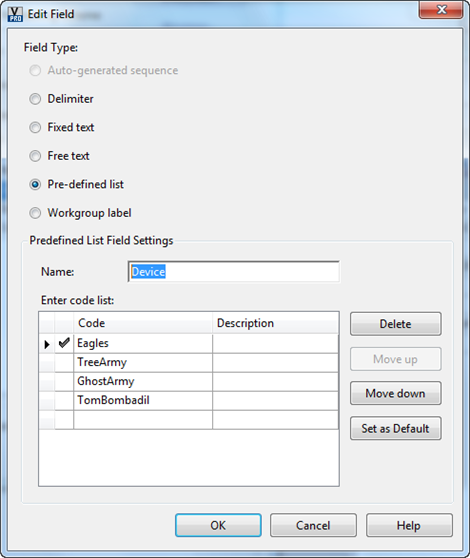 You chain together different field types to create your naming pattern. It’s more powerful, but it’s also more difficult to work with. Items and Change Orders use this engine too. Unfortunately, there is no way to “rollback” a number. Once it’s generated, it’s reserved forever. 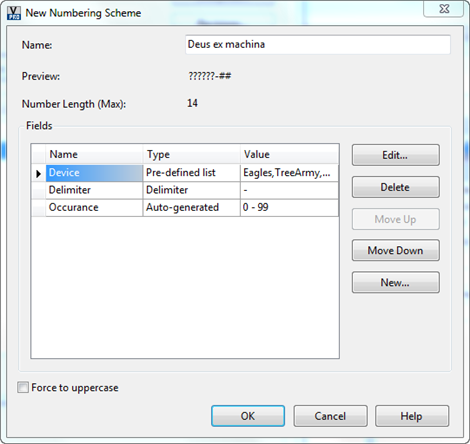 Here are some screenshots from Vault Explorer that illustrate how fields are hooked together to form the numbering scheme. The final entry in my Vault Integration Pattern series will focus on using Vault’s job queue for transferring data. Like I said before, there are more integrations patterns out there, I’m just focusing on the ones that I have used first-hand. I used this technique for the short-lived integration between Vault and PLM. Let me just get this out of the way upfront: The integration pattern I used had nothing to do with the app being discontinued. The long term vision changed, and the integration was caught in the middle. From a technical standpoint, the integration pattern is sound. Since PLM is in the cloud and Vault is behind a firewall, there was no easy way for PLM to have a direct view into Vault. Data would have to be copied to PLM. I also wanted a very reliable mechanism for data transfer, so doing it real-time in the Vault clients was not a good fit. I went with the Vault job queue because it provides a guaranteed mechanism for the data transfer. If it’s on the queue, I can rely on it staying on the queue until it gets properly dealt with. If there is an error, it’s logged in the form of an error job on the queue. If something critical goes wrong, like a power outage, the job is still on the queue in the processing state. The downside is that the queue is asynchronous. Even if you grab jobs directly off the queue you are still relying on polling. There is no way to instantly know when the job is queued. The other major disadvantage is that it runs without any user interaction. So you can’t prompt the user for information and you can’t rely on problems getting addressed immediately. If you are replicating data this way, I highly suggest having some kind of re-sync button. It’s great when developing and debugging. It’s also doubles as a bulk-load command, which is usually a requirement for integrations like this. Lastly, it’s a magic fix-all button for a bunch of difficult error cases, such as a user deleting data manually. These re-sync buttons tend to be slow, but that’s OK because things are asynchronous. Also, with the job queue priority feature, you can insure that the re-sync doesn’t interfere with everyday operations. Guaranteed delivery - Jobs on the queue are guaranteed to stay there until something process them or the Vault admin removes them. Failure recovery - Failed jobs can be re-submitted. Background process - Doesn’t interfere or slow down normal operations. Conflicts - The same data may get updated at the same time in two different systems. Asynchronous - You have to wait before you can see results. Duplicate data - The same data is now in two different systems. If you are building your own custom job, you do not have to plug-in to Job Processor if you don’t want to. The job queue can be accessed through the Vault web services API, just like with files and folders. The recommended approach is to use Job Processor. That approach is what you see in the SDK documentation and sample apps. But the Job Processor can’t handle all the cases. There are some times when you may want to just write your own service. This article will help you identify those cases and provide some help writing the code. First let’s talk about what Job Processor does well. It’s a single application than can handle multiple job types. It has various job handlers loaded out-of-the box, and additional functionality can be plugged in. For a Vault admin, this is good because everything can be managed from a single app. If something goes wrong, there is only one place to look, one log file to check, and so on. From the developer's point of view, Job Processor offers some nice features. You don’t have to worry about Vault authentication, managing the job queue and logging. None of these things are very hard, but it’s nice to have the app take care of them. On the flip side, Job Processor does have some limitations. First, it’s not a true Windows service. A user has to log in, launch the app, and leave it running. Job Processor handles jobs one at a time. There is no parallel processing. And you can only run a single process on a machine. A common problem is that Job Processor gets bogged down with jobs that take a long time, like DWF generate jobs. This prevents other types from running even if they take less time to run. If you are running in a multi-site environment, Job Processor can only process jobs from one site. Vault requires that a job can only be handled by the site that queued it. So if you have 5 sites queuing jobs, you would need 5 Job Processors running. ReserveNextJob - This grabs a job and reserves it to you so that nobody else works on it. You pass in the job types you support and Vault passes back the “next” job based on the priority and the time it was queued. UpdateJobSuccess - This tells Vault that you are done with the job, and it can be removed from the queue. UpdateJobFailure - This tells Vault that something went wrong. The job stays on the queue in the error state. You can pass back information on what went wrong. UnReserveJobById - This function is used for cases where a job gets reserved but never updated. For example, maybe the service crashed or there was a power outage. If you want an example, have a look a Q-Tools. It’s a Windows service that can interact with queues from multiple Vault sites.